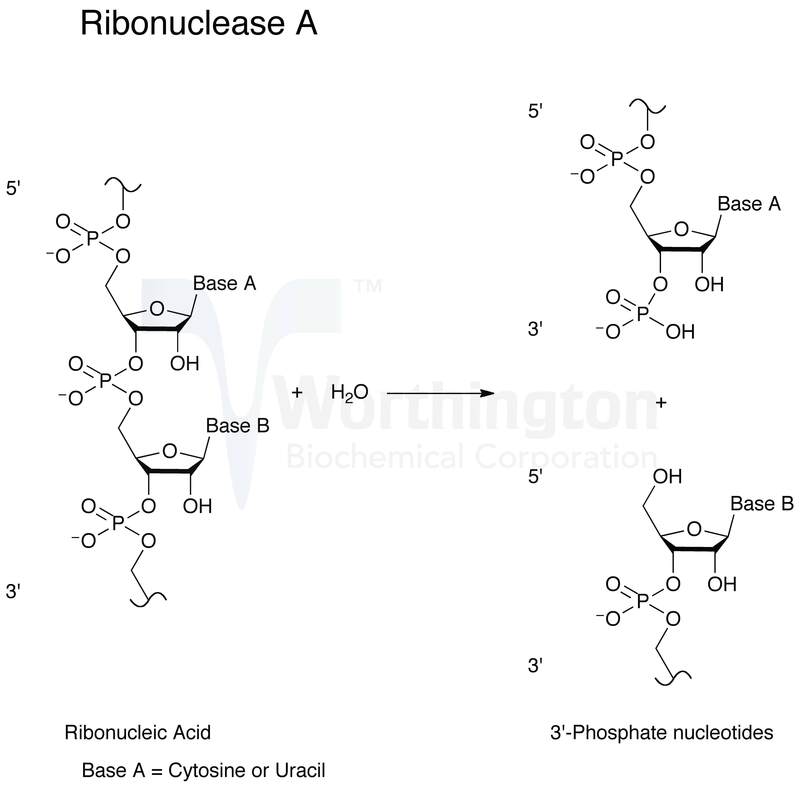 Pancreatic ribonuclease (RNase) is an endoribonuclease. It catalyzes the cleavage of the phosphodiester bond between the 5’-ribose of a nucleotide and the phosphate group attached to the 3’-ribose of an adjacent pyrimidine nucleotide. This cleavage forms a 2’,3’-cyclic phosphate, which is then hydrolyzed to the corresponding 3’-nucleoside phosphate. RNase is found in greatest quantity in ruminant pancrease (Barnard 1969). The major component of the crystalline enzyme is RNase A; a minor component is RNase B. RNase B is the glycosylated form of RNase A (Beintema et al. 1976). The work of Jones in 1920 is usually cited as the “beginning” of pancreatic ribonuclease (Richards and Wycoff 1971). RNase was isolated by Dubos and Thompson in 1938 and crystallized by Kunitz in 1940. In 1947 Worthington was the first company to manufacture highly purified crystalline RNase. In the early 1950s, the company Armour prepared crude crystalline enzyme, and offered it at a very affordable price. Through the 1960s and 1970s, RNase A was a favorite to study primarly because it is remarkably thermostable and present at high concentration in an accessible source, bovine pancreas. These studies led to the elucidation of the crystal structure (Anfinsen 1959, Groves 1966, and Scheraga 1967), determination of the amino acid sequence (Smyth et al. 1963), identification of the catalytic mechanism (Beers 1960), and clarification of folding pathways (Hantgan et al. 1974). RNase A was the first enzyme and third protein for which a correct amino acid sequence was determined (Raines 1998). Four Nobel prizes have been awarded for work associated with studies of RNase (Anfinsen, Moore, Stein, and Merrifield). The vast literature and numerous studies have made RNase the most extensively studied enzyme of the 20th century (Raines 1998). Recent work continues to investigate the synthesis and maturation of RNase in the endoplasmic reticulum of live cells (Geiger et al. 2010). Much work is also still being dedicated to studying the folding and aggregation of RNase (Benito et al. 2008, Iwaoka et al. 2008, and Arai et al. 2010). The enzyme’s role in cancer development and gene regulation is being studied (Shlyakhovenko 2009), and it is being developed into cancer chemotherapeutic agents (Chao et al. 2010). RNase A is specific for pyrimidine nucleoside linkages (Volkin and Cohn 1953). The reaction is believed to take place in two steps. In the first step, the 3’,5’-phosphodiester bond is cleaved, while generating a 2’,3’-cyclic phosphodiester intermediate. In the second step, the cyclic phosphodiester is hydrolyzed to a 3’-monophosphate group. The first step is nonspecific with respect to the nitrogenous base of the substrate; however, the second step is absolutely specific for pyrimidine nucleotides with terminal 2’,3’-cyclic phosphates. RNase B has the same specificity as RNase A toward both cyclic cytidylate and yeast RNA (Plummer and Hirs 1963). RNase A shows a preference for larger substrates (Nogués et al. 1995). The enzyme cleaves at cytidine residues twice as fast as at uridyl residues (Richards and Wyckoff 1971). Thr45 has been found to be most important for mediating the pyrimidine specificity, both by forming hydrogen bonds with pyrimidine bases and sterically excluding purine bases (del Cardayré and Raines 1994). The side chain of Asp83 is important for stabilizing the transition state during the cleavage of uridine-containing substrates; this residue has no effect on the kinetics of cytidine cleavage (del Cardayré and Raines 1995). The shape of the protein resembles a kidney, with the active site residues laying in the cleft (Richardson 1981, and Raines 1998). The secondary structure contains long four-stranded anti-parallel beta-sheets and three short alpha-helices (Raines 1998). RNase A contains four disulfide bonds, which are critical to the stability of the native enzyme. Two of these disulfide bonds lie between an alpha-helix and a beta-sheet and contribute more to the thermal stability than do the other two (Klink et al. 2000). RNase B is a glycoprotein containing at Asn34 a single oligosaccharide composed of six residues of mannose and two residues of N-acetylglucosamine (Tarentino et al. 1970). RNase A is a small protein, the mature enzyme only having 124 amino acid residues, with no carbohydrate attached. RNase A contains 19 of the 20 amino acids, lacking only tryptophan (Nogués et al. 1995, and Raines 1998). The three dimensional structure of RNase A is fully encoded by its amino acid sequence (White and Anfinsen 1959, and Raines 1998). All eight human RNase A-like genes are located on chromosome 14. Each encodes a secretory signal sequence and contains an invariant catalytic triad of two histidines and one lysine with a conserved motif (CKXXNTF) (Marshall et al. 2008). The amino acid sequences of many RNase A homologues have been identified, making RNase A a model system for vertebrate molecular evolution (Dyer and Rosenberg 2006). From the sequences and their distribution over a range of species it has been established that RNase A is a modern protein that is evolving rapidly (Doolittle 1992, and Raines 1998).